Burberry was founded in 1856 when 21-year-old Thomas Burberry, a former draper's apprentice, opened his own store in Basingstoke, Hampshire, England. By 1870, the business had established itself by focusing on the development of outdoors attire. In 1880, Burberry invented gabardine, a hardwearing, water-resistant yet breathable fabric, in which the yarn is waterproofed before weaving. The Gabardine was patented in 1888. Burberry was the original name, but then the company soon switched to using the name Burberrys, after many customers from around the world began calling it Burberrys of London. This name is still visible on many older Burberry products. In 1891 Burberry opened a shop in the Haymarket, London, which still exists and is the site of Burberry’s corporate headquarters. In 1901, the Burberry Equestrian Knight Logo was developed containing the Latin word "Prorsum", meaning forwards, and registered as a trademark. In 1911 they became the outfitters for Roald Amundsen, the first man to reach the South Pole, and Ernest Shackleton, who led a 1914 expedition to cross Antarctica. In 1914 Burberry was commissioned by the War Office to adapt its officer's coat to suit the conditions of contemporary warfare, resulting in the "trench coat". 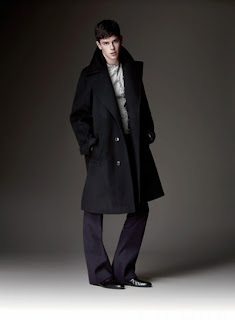 After the war, the trench coat became popular with civilians. The iconic Burberry check was created in the 1920s and used as a lining in its trench coats. Burberry also specially designed aviation garments. A. E. Clouston and Mrs. Betsy Kirby Green made the fastest flying time to Cape Town from London in 1937 and were sponsored by Burberry. Burberry was an independent company until 1955, when it was taken over by Great Universal Stores (GUS). Burberry Group plc was initially floated on the London Stock Exchange in July 2002. GUS divested its remaining interest in Burberry in December 2005. In 2006 Rose Marie Bravo, who as Chief Executive had led Burberry to mass market success, retired. She was replaced by current CEO Angela Ahrendts.